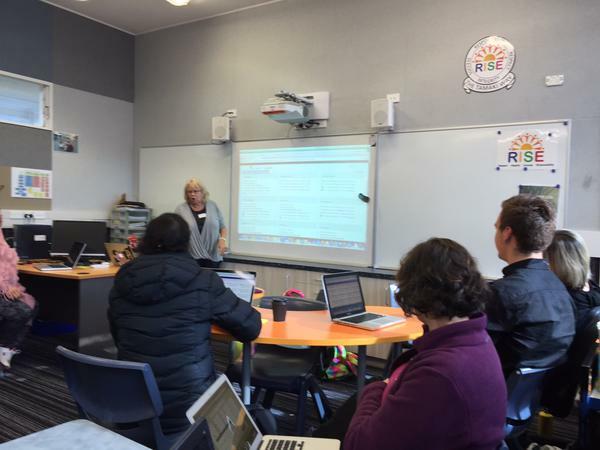 EducampAkl is amazing professional learning for teachers. This years session was coordinated by Fiona Grant and team. The hosting school was Tamaki college so we got the chance to see inside a different school. The incredible part is that it is free and you have the opportunity to find out more about a burning question or issue that has been a little difficult to answer. You spend a day on your own professional learning and learn about edu stuff that you want to know more about. Technically the day is about you as a learner. You say what you want to learn and someone helps you learn it. I was really excited to have Belinda and Waveney join me from Newmarket School so they could see what I rave on about every year. Saturday 25th of July was fabulous and I got to meet and make connections with lots of new people and reconnect with many virtual acquaintances. 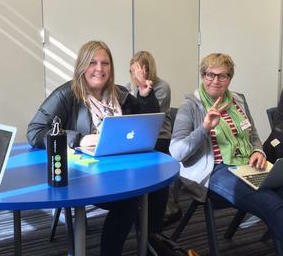 One reason I attend #educampakl sessions is to put the face behind the twitter handle. 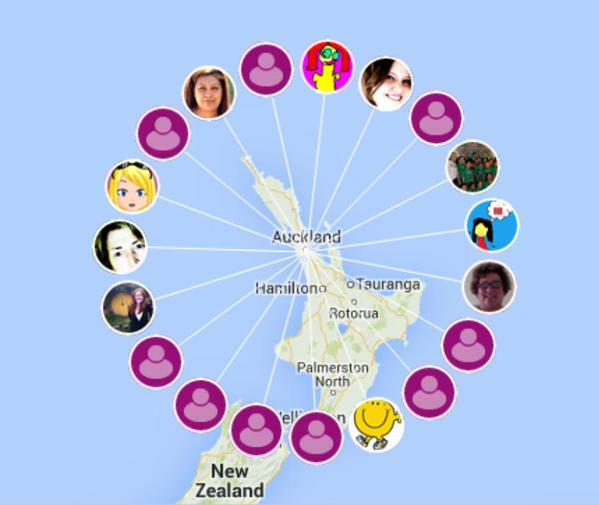 I shared the upcoming #edchatnz project that I created to bring teachers together for virtual collaboration. Therefore free PD in your PJ’s. 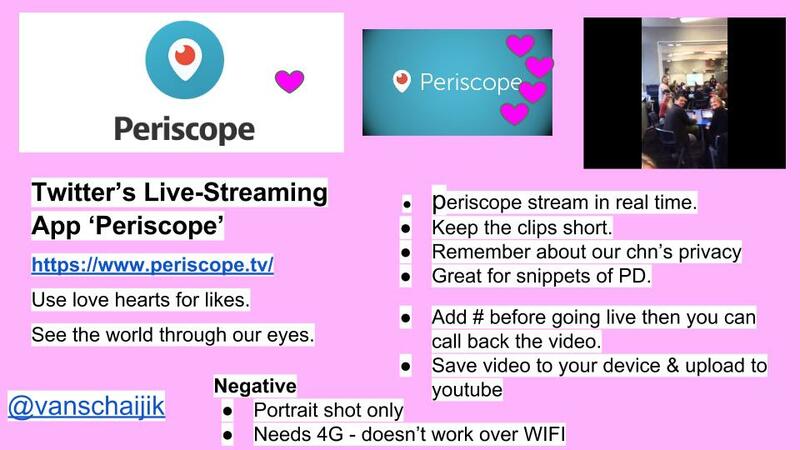 I shared about a twitter app called Periscope that has the facility to live stream. I have added a summary to my slide and embedded the short demonstration clip I took during Fiona Grant’s introduction. Today I attended sessions by @lenva @tanya @gmacmanus @codingpoet. Gerard spent time with me and a few other visiting Pond. One of my burning questions was how easy would it be to set up a Newmarket School group in the POND. He showed us how to activate the Geo map and see our teachers and I really like this image that was generated in regards to Newmarket School. I had another lesson in curating and sharing content. He was patient and awesome but I still had the feeling that our teachers have when they work with me and tell me you are going too fast. POND as a tool is amazing and I will continue to put in some hours to learn it because it is worth it. Lenva from Hapara covered Hapara Workspace. The workspace comes live on Monday. I believe we should upgrade our package to include Hapara interact. This costs a little extra on the package and is something I will recommend we do for when we renew our license as this will allows us to help keep our students safer. We already love Hapara and the extra facility will support teachers in their work too. Anything that helps our children and teachers is worth a little extra. I called together any presenters who have been on TeachMeetNZ to come for an obligatory photo, the task was like trying to herd puppies, so in the end I created a montage. Even then I still missed James. The exciting part of Educamps is meeting up again and having a bit of a catch up. 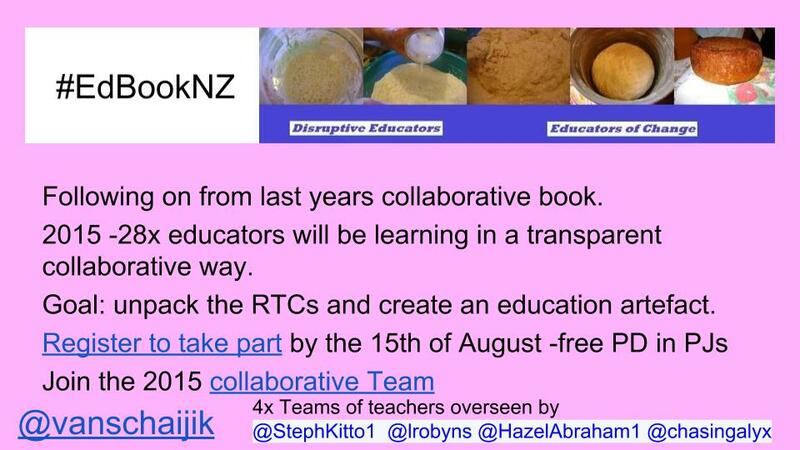 I pulled in Fiona too to this one because she is presenting on the TMSydney combined with TeachMeetNZ in October. Here they all are so do follow them on twitter. I give a shoutout here for the upcoming Virtual Learning Network Webinair ‘Personalising PLD using social networks’. So pop along and register. I will be sharing TeachMeetNZ and Danielle Myburgh is sharing Edchatnz. Tanya was running a session so I popped in and had a listen. I ninjaed her notes. 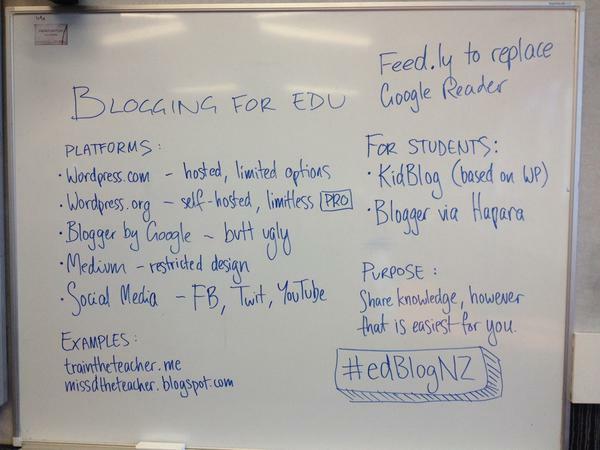 You can also find a fabulous list of New Zealand educator blogs here. You can also add yours if it is not there. After Tanya, I listened to Clinton sharing about Configurator and Meraki. I really like the way he speaks, as in the practicalities and how to save school money. I have found configurator a real challenge especially with purchased apps. 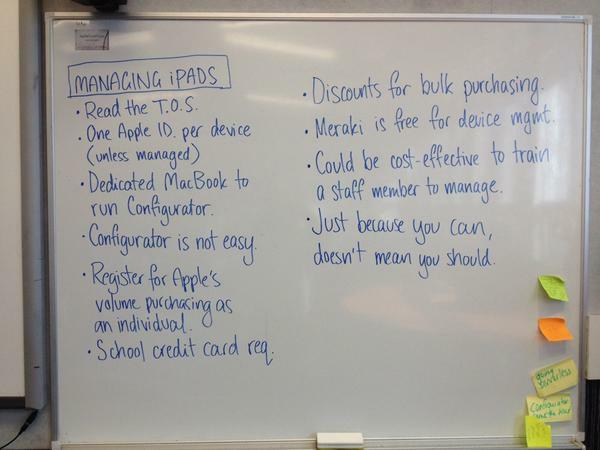 When a teacher asks me about adding new apps to the system I now totally ignore them. However from now one I will put across to them to trial the app first on their teacher iPad using their class budget to buy the app, test it with a group of students and then write me a proposal of the value of purchasing the app for the ipads. If they can be bothered to do all that, then I can be bothered to spend hours fighting configurator to install it. The last holidays I just could not face spending another full week updating the system. There must be a better way. I wonder if there are schools who could do with a refresher and together we fly him up for a day’s training. Clinton said that he would create self help videos so I look forward to those. Again notes are from Tanya. I also found out that iPad 2 system charges for apple apps but these are given with later models. Clinton also cautioned against giving children printing rights on a chrome. I agree with him. I still cannot understand teachers who want children to be able to print from the chrome. As we move more and more digital, are they not aware that the doc can be shared? Learning with teachers from Newmarket School. Catching up with TeachMeetNZ presenters. Connecting with others watching the twitterstream. Finishing off with pizzas and drinks from Network4Learning. Sonya, so great to hear you had a great day with plenty of good connections made. Sorry I wasn’t able to make it, but I’m glad the N4L drinks and pizza went down well! Will catch up with you about groups and get you going in Pond in no time. Groups are just as easy to make as buckets. Go for it!